Clijsters now has a 13-12 winning record over her Belgian rival. 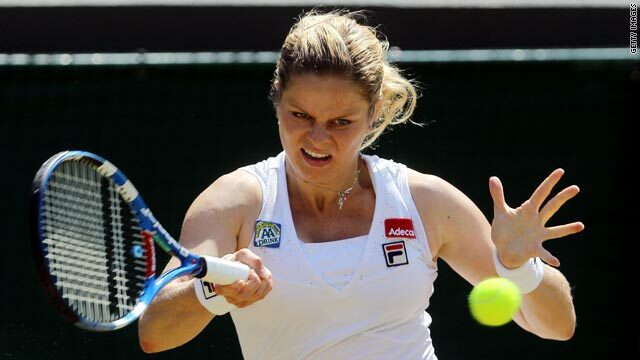 (CNN) -- Kim Clijsters overcame her fellow Belgian Justine Henin 2-6 6-2 6-3 after a tight battle on Monday to reach the quarterfinals at Wimbledon. Clijsters, the eighth seed, made a number of errors in the first set but rallied to win the next two, making the crucial break in the eighth game of the decider. The victory gives Clijsters a 13-12 lead in the head-to-head meetings between two former world numbers ones who have both come out of retirement to compete at the highest level again. "I was just very overwhelmed in the beginning by the speed of her game," Clijsters told the official Wimbledon website. "In the second set, I was going for the lines a lot better, keeping the pressure on her and I made a lot more first serves. For me, that was a very important change in the match." Clijsters will next face Russia's Vera Zvonareva, who advanced to the last eight when fourth seed Jelena Jankovic had to withdraw because of a back injury. Jankovic was trailing 3-0 in the second set when she called a halt to the match. Third seed Caroline Wozniacki is also out following a 6-2 6-0 thrashing by Czech left-hander Petra Kvitova. Meanwhile, both Williams sisters are through to the last eight after victories on Monday. Defending champion Serena beat Maria Sharapova 7-6 6-4 to set up a meeting with China's Li Na, while second seed Venus overcame Australian Jarmila Groth 6-4 7-6 and will next face Tsvetana Pironkova of Bulgaria. "She served extremely well, some of the best she served against me," said Sharapova, who beat Williams in the 2004 final. "I gave her a run for her money but that was really the difference."